Halfway through a discussion about valuing the voices of indigenous artists, one of the four panelists onstage pointed out how unlikely the gathering was. What are the chances, "that we're here right now in this venue," artist Nicholas Galanin pointed out, "based on its history and who's been sitting in these seats." The venue in question: the Walker Art Center. On Thursday night, Minneapolis-based artist Dyani White Hawk, who is Sicangu Lakota, moderated a panel that has been in the works since last year, when the Walker faced intense criticism for installing "Scaffold" in the revamped Minneapolis Sculpture Garden. Native Americans and others protested Sam Durant's sculpture -- based partly on the gallows used to hang 38 Dakota men in 1862 in Mankato -- leading to its dismantling. Then came the touring retrospective of Jimmie Durham, who has identified himself as Cherokee, despite not being recognized by the three Cherokee tribes. After White Hawk and others met with Walker leaders, the Walker tweaked that show's introduction and edited language throughout the galleries. The panel Thursday began with Kate Beane, of the Minnesota Historical Society, who welcomed guests by speaking in Dakota. Then White Hawk posed big, knotty questions about what museums should do to make room for Native perspectives. 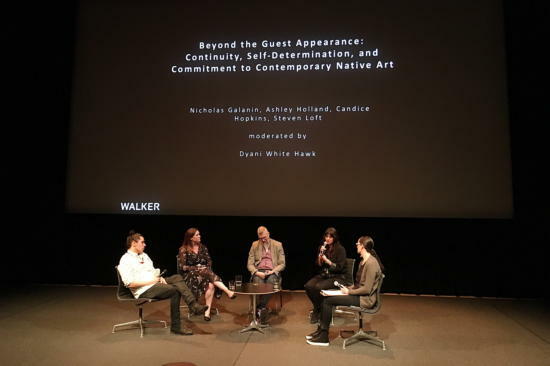 The four panelists -- artists and curators Nicholas Galanin, Ashley Holland, Steven Loft and Candice Hopkins -- "have extremely long and deep experiences working within institutions," White Hawk said, "working in the belly of the beast." Art centers need to hire indigenous staff: When museums reach out, saying, "'How can we do this? Can you tell us who to work with?' my first question is always: How many indigenous people are working there? And the answer is almost always none," said Loft, director of indigenous arts at the Canada Council for the Arts. "That's where it's got to start." Art centers need to show works by indigenous artists: Group exhibitions are great, Hopkins said, but solo shows "start to change art history." Art centers need to involve Native American communities: "We're often only called in when it's a Native question," Hopkins said. "We need to be brought in for many questions." Such moves can't just be made in times of crisis, the panelists argued. "These changes need to be permanent," said Holland, a doctoral student at the University of Oklahoma in Native American art history. "This cannot be something that after next year, we don’t see indigenous art again for 10 years, for 15 years. "Because that's what's happened in the past," she continued. "It comes up, it’s in the view of people, and then it goes away. But we don’t go away. We’re still here." They shared struggles: Of being the lone Native American person in an institution, of risking professional strides by speaking out. Then they shared successes. "I also feel maybe slightly optimistic in the fact that this conversation is even happening -- that I heard Dakota language within the Walker Art Center," said Hopkins. "So I think there is a bit of space being made, and I think it's on us, together, to think about what we're going to do with that space."